Since Donald J. Trump became president, many U.S. partners in Southeast Asia have worried about whether the United States will remain the region’s guarantor of security and trade integration, and the Trump administration’s approach to Southeast Asia has lacked consistency. But there is still time for the Trump White House to advance its goals and restore Southeast Asians’ trust in the United States. U.S.-Vietnamese relations provide an ideal opportunity to do so. The White House has adopted a tougher approach to the South China Sea, expanding freedom of navigation operations, and has taken a stronger stance against China’s anticompetitive trade practices. In addition, the Trump administration has rolled out a broad strategy for the region, called the Free and Open Indo-Pacific. It vows to promote a rules-based security and economic order in Asia, while also encouraging closer cooperation among regional U.S. partners. Yet at the same time, the Trump administration has sent worrying signals to Southeast Asia, and overall, the administration’s erratic approach to policymaking has undermined Southeast Asians’ confidence in the United States. For the Trump administration to restore Southeast Asian states’ trust in the United States as an indispensable external actor, it needs to show that tough policies are not just designed to favor the United States but also can benefit Southeast Asia, one of the world’s fastest-growing regions economically and an area of significant strategic value. It can do so in Vietnam. There, Trump’s tough rhetoric on trade and security jibes with sentiment in the country, and Vietnam is the Southeast Asian state most actively defending its interests in the South China Sea. 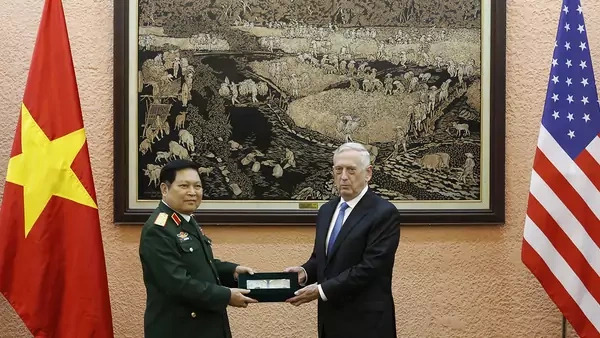 Hanoi recognizes that though working with Washington risks provoking Beijing, China is already trying to intimidate Vietnam. Hanoi is already essentially putting into effect aspects of the Free and Open Indo-Pacific strategy. By adopting tougher regional strategic and economic measures with Vietnam, the Trump administration could demonstrate to Southeast Asia that its harder approach could be in their interests. It could further convince them to embrace the Free and Open Indo-Pacific.